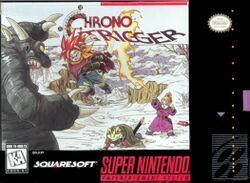 Chrono Trigger is an RPG developed and released by Square, originally for the SNES in 1995. In 1999 it was re-released for the PlayStation and in 2001 it was included in Final Fantasy Chronicles. In 2008, it was released for the Nintendo DS. In 2011, Chrono Trigger was released for in Japan for iOS. Later that year it was released globally on the Wii's Virtual Console. The original PlayStation version was re-released on the PlayStation Network for the PlayStation 3 in the fall of 2011. An Android version was released on February 27, 2014. The iOS version was released internationally by June 6, 2014 (version 1.0.4's release date). The Steam version was released on February 27, 2018. The game features a version of the "Active Time Battle" system that is sometimes used in the Final Fantasy series (which means players can be attacked while choosing options in battle), and incorporates original concepts throughout the game. In addition, time travel is an important plot element that is used constantly over the course of the adventure. This game is also notable for having a large variety of endings. Crono, the main character, wakes up one day, ready to go to the once-in-a-lifetime Millennial Fair. His childhood friend, Lucca, has decided to build and show off a teleportation machine for the fair. While on his way to see her invention, Crono bumps into another girl, Marle, who decides to accompany him. As a good friend, Crono volunteers to be Lucca's guinea pig, allowing himself to be moved from place to place. Marle, excited and now feeling safe, decides that she wants a turn and steps up to the machine. As Lucca and her father work the controls, Marle's necklace begins to glow, setting in motion a time travel journey of epic proportions none of them could have expected. Living in the seemingly peaceful kingdom of Guardia in 1000 A.D., the child CRONO was chosen by guardian spirits to save the world from ultimate devastation. Though Doomsday will not happen until the year 1999, the ancient seeds of destruction were planted long ago by the evil LAVOS. Your mission in the world of CHRONO TRIGGER is to travel back and forth through time to change the course of history, and stop Lavos from succeeding in his dark plan. On your journey, you will battle monsters and meet many helpful people in both the past and the future. Some will become your faithful and powerful companions, while others will give you clues by telling you stories. Pay attention to what they say, and good luck in your adventure. Nintendo DS USA front cover. DS Japanese Ultimate Hits front cover. Apple Store page for Chrono Trigger. 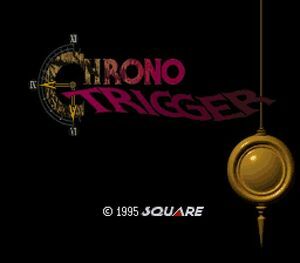 Google Play Store page for Chrono Trigger. This page has been accessed 303,947 times.